I would like to offer my popular free item so that you can take a look at my work. I use it with my 6th grade English classes and they love it. Perhaps they like it so much because they get rewards for participating and they don't realize that they were actually learning something. This is 4 weeks of 5-10 minute warm up exercises for the beginning of English that will help reinforce grammar, parts of speech, etc. There is a worksheet on nouns and verbs, 2 worksheets on Possessives, a writing prompt and grading rubric. 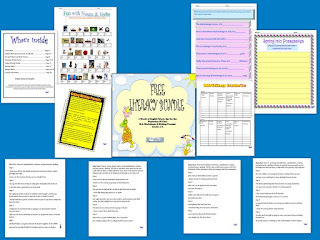 It is used with 6th graders, but can be adapted for any grade level. You can also utilize this if you are teaching a foreign language. Write two sentences incorrectly on the board. Have students correct the sentences at their seats. After they are finished, choose someone to go to board and write the sentence correctly. You can base the sentences on what you are doing that week in class. For example, if you are teaching capitalization and punctuation, the sentences should reflect this. You can also ask what type of sentence it is: Exclamatory, Interrogative, Declarative, or Imperative. If you are studying parts of speech, ask which word is a noun, verb, etc. After they have finished writing the sentence, have one child come to the board and correct it. Then ask the class if it’s correct. If not, the student that corrected it can come up and fix it. Then have them tell you what makes the sentence/ word correct/incorrect if it is wrong. That way they will learn the rules. Then choose another child to correct the second sentence and repeat the process again. To help motivate the kids, give them a reward for coming up and writing the sentence correctly. You can also reward them for just coming up and writing the sentence, even if they make a mistake or two. The reward can be a candy, classroom privilege, a star next to their name,etc. I hope you like this, I'd love to hear your comments. Please visit my store to see my other items and follow me at Socrates Lantern, just click the green star.